Starring: Judith Evelyn, Tom Helmore, Adele Mara. Written by Donald S. Sanford, based on the short story by Harold Lawlor. 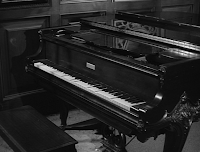 Recovering from a serious heart ailment, pianist Mildred Beaumont (Evelyn) is convinced she's seeing her own funeral, played out in her living room. Of course, it's her slimy husband Eric and his lover, Mildred's sister, Lydia who have joined forces to scare Mildred to death. JS: You'll know you're in the second season of Thriller when all of a sudden you see writer and producer title cards amongst the sticks (or as I prefer to think of them, caught in the spiderwebs). Welcome back everyone! We hope you all enjoyed your summer break! PE: What better way to follow your best episode than to bring your viewers back down to earth again with this junk. I know that many episodes of Thriller are packed with hoary cliches but the show's grime, dust and cobwebs take our minds away from those old plotlines. Well, there's no atmosphere to speak of in this show and so we're left to ponder how something like this gets made. JS: In all fairness, we ended Season 1 on the highest of highs, so it's reasonable to expect that any follow up was not going to live up to "The Grim Reaper." I actually thought it started off promising, being a sucker for a well placed coffin, but in no time at all were back to bedridden old biddies! PE: Did someone high up in the Thriller food chain see The Tingler and think "You know, Judith Evelyn really plays 'scared to death' remarkably well. I want to see her scared to death again but let her talk this time!" To add insult to injury, Jerry Goldsmith seems to have taken the week off as well. JS: What makes it worse is that it's like Diet Tingler-Zero. Who wants to see The Tingler without The Tingler? Judith Evelyn is okay as Mildred, but it's definitely a case of been there, seen that. Unless skeletons are involved, I could do without another my-spouse-is-cheating-on-me-and-planning-my-untimely-demise story. 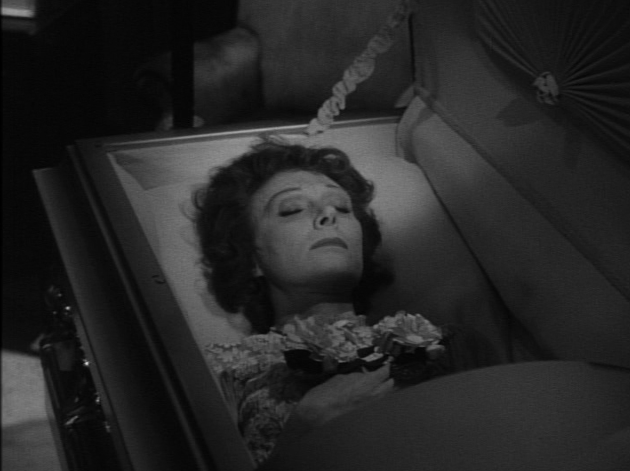 PE: Big time Thriller moment: In the big "Let's Scare Mildred to Death" scene, the poor old woman not only sees her coffin and hears a mournful organ track but also sees her own dead body lain out for guests. 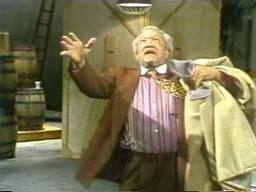 This, of course, does the trick and like George Sanford ("It's the big one! I'm comin', Elizabeth'), Mildred clutches her... stomach... and goes down hard. Afterward, we see that the body is actually evil Lydia in a very lifelike mask! Yeah, if you saw Lydia walking down the street in her Mildred mask, you'd be completely fooled. JS: While I'm a fan of ghostly piano playing, I think the scenes herein play like we're watching a player piano. When The Ghost and Mr. Chicken (one of my personal favorites, BTW) is scarier than an episode of Thriller, it's safe to assume something isn't working. 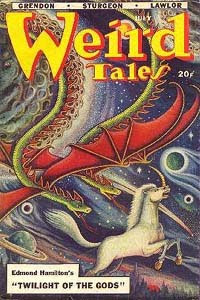 PE: "What Beckoning Ghost" by Harold Lawlor first appeared in Weird Tales, July 1948 and though I've never read it, I have to assume it's better than the dramatized version. JS: P.S. Be sure to check out our Season 1 Mid-Term report, posted late last night. We list the most visited episode reviews on the blog, Peter and I pick our Top Ten episodes from the first season, and we crown the acting achievements we admired the most! I bet both the TINGLER folks *and* the THRILLER folks were thinking back to her stage days as the wife that is either gonna get scared to death or driven mad in ANGEL STREET/GASLIGHT. For one brief, shining moment...we all came together - authors, experts, fans, industry pros, bloggers...and embraced the greatness of "The Grim Reaper", and, like a...(sob)..a FAMILY celebrated the common bond that unites everyone here at "A Thriller a Day". You've got Frye, Lawlor, Sanford, Lupino and Goldsmith, a pretty solid line-up to guarantee a dynamite second-season opener. And the failure of "Beckoning Ghost" to meet those expectations anticipates, to some degree, the quality of much of the 2nd season, which often fails to rise to the level that had been established in the last few weeks of season 1. I like the weird Goldsmith piano waltz with the distant reverb, a nice spooky effect. I also thought the single, continuous shot of Judith E. in her coffin and Judith E. standing next to her coffin was pretty cool; after such a slow, mundane Act 1, it briefly felt like this show was going to begin to pick up but, alas, the script is so run-of-the-mill that it's difficult to get oneself involved---ESPECIALLY coming on the heels of season 1's great stuff. Adele Mara, a major babe in her day, was not much of an actress (I recognize her from a 1943 Stooges short where she appears briefly as a secretary who is menaced by Larry Fine). I was pretty astounded by that terrific fall and CRASH that she takes courtesy of Tom Helmore; but, when things like this stand out as highlights of the episode, you know you're in big trouble. FOUR out of 10 Karloffian heads. (sniff) we got more hits on our blog when we said Pigeons was crap than when we all united as one to sing Osmond Brothers songs and hoist Stellas. There's something wrong there, methinks. Chins up, we've got "Guillotine," "The Weird Tailor," etc., etc. to look forward to. 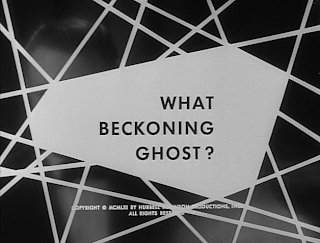 As for "What Beckoning Ghost?" I confess that I could barely make it past the teaser. It's fun to find Tom Helmore in the cast -- I may have this 100 percent correct, but didn't Karloff swap wives with Helmore? Karloff married Helmore's wife Evie, and Helmore got one of Boris' cast-offs? Something like that. 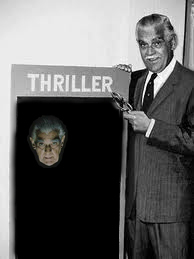 Hats off to Hollywood's greatest swordsman, King Karloff. Besides Goldsmith's music, one thing I like is that this episode presents an ideal opportunity to study Lupino's superb sense of moving the camera, and not JUST for effect (as in today's rampant visual masturbation) but to actually tell--and propel--the story. That the story's not a good one is unfortunate, but Ida was aces. Huh, I just noticed that my post disappeared. Maybe the transfer to a new format had something to do with it? I'll write up an abbreviated commentary. 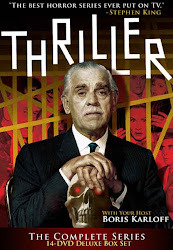 The first season of Thriller ended with a lot of strong episodes. You think that the Thriller team finally got the formula right and season two would start out strong. Nope. What Beckoning Ghost isn't that bad, but it is a let down and an odd choice to welcome back Thriller fans. We have the umpteenth episode that involves cheating. Most of the episode only involves the three primary players mucking about Mrs. Beaumont's mansion, which gives the episode a sparse and lower budget feel. The central "dream" plot point, although somewhat obvious, still keeps the viewer from getting their bearings around the proceedings. The cast was good. Judith Evelyn did a fine job of projecting paranoia. Tom Helmore appeared to be stuck in at least one decade past, but conveyed the right amount of oily sleeze. Miss Mara was a bit too young and modern to be around the arm of Eric. I loved that one bust lingering shot of her on the staircase. How'd that get by the TV censors?! Two Karloffs for the Season two opener. Season one ended with a two of the best Thrillers, so you think that the good folks at Thriller would build upon this wicked greatness. Nope, the opening episode for Season two in a couple of steps back. What Beckoning Ghost? has a bare bones feel. I enjoyed in the three main leads, the plot was ok, but everything felt like a B level Thriller from the 1940s. Judith Evelyn was convincing in her portrayal of a woman slipping into ill health and questioning her sanity. Tom Helmore was effective as the sleazy and conniving hubby. Adele Mara was the episode's only tangible evidence that it was filmed in the 60s and not two decades earlier. The early events give a peak at the plot hand, but we're still not sure at what we saw. After 30 minutes of dragging the mystery out, the plot hand is laid on the table and sure enough, confirms our initial sneak peak. There is one absolutely delicious camera shot of Adele Mara. After the tryst between Eric and Lydia is confirmed, the camera looks down for several seconds on a busting at the seams Lydia standing midway up the stairs. Am I the only one who was surprised that this blatant bit of naughty cinematography didn't get cut? Anyway, after Mildred's premonition comes true, Eric seems to be the next in line for an exit. I wasn't sure if this was either a plot by Lydia to get all of Mildred's money or if Mildred faked her heart attack and was getting back at the two schemers. It turns out that it was either Mildred's ghost or the two sinners were slowly going insane. A let down of an opener, but still not near the bottom of the Thriller staircase. Two Karloffs for What Beckoning Ghost? Its better than 1 Karloff- a routine ghost story is better to watch than a routine crime story. I have it at #36 of 67, 2 1/4 Karloffs. Its sufficiently scary just not original enough. I just kinda wondered how a ghost could order funeral wreaths and get someone to engrave the death date on her husbands crypt...when such detritus distracts you from the story you know it ain`t a thriller. Two stars though because of Ida Lupino`s efforts to make gold out of manure and this still beats any of the first dreadful six episodes from season one. As a Judith Evelyn fan, it's nice to see her again and gain a finer appreciation of her mime and expressive gestures in THE TINGLER. Helmore's like an old, disreputable friend thanks to his providing the murderous spark for the drama in Vertigo. Adele Mara looked wicked enough and had a '50s-style set of ahem - front assets that just won't quit. It could have been far better with more darkness in the mansion, and a faster pace. The driving of Mildred to madness, panic and death could have been paced to pack a real wallop, but the arc seems to meander when it should have been brutally focused for maximum effect. Not the worst episode, but far from the best. The 2nd season opened not with a bang, but a whimper. This is a pretty pedestrian effort after "The Grim Reaper", but at the same time, you can see a few similarities. In both stories, the Female Lead dies 30 minutes into the story, and the last 20 minutes are about how her killer gets his. I got the feeling that on some level they were trying to recreate Reaper (and failing). The opening is good, but as with many Thriller episodes, the plot depends on lead characters drinking a couple of gallons of Dumb Water. The viewer figures out about 5 minutes in that the husband and sister are trying to scare Mildred to death. They officially confirm it at 20 minutes in, and make the kill at 30 minutes. Despite clear cause for suspicion, Mildred cheerfully signs her money away. Hubby pretends to refuse to accept it. Calls her lawyer up and tells him to tear up that darn paper. But (rather obviously) we never hear anyone on the other end of the line, and hubby makes a point of telling him NOT to send Mildred a copy of the new document. Yet this fails to send up any red flags. Hubby scarcely needed to make that phone call at all. One feels that Mildred would have still trusted him even if he'd accepted the document and stuck it in his vault in front of her eyes. She never bothers to call the lawyer herself and confirm the conversation. "Why, the plot wouldn't work if I did that!" But wait a minute, she DID suspect him at first, didn't she? What happened to allay her fears? Nothing much at all. She just overheard a phone conversation between hubby and someone claiming to be a doctor. That's all. What did PT Barnum say was born every minute? What kind of wife lets her more attractive, 15 year younger sister live with her and her husband, anyway? Even with no evidence of foul play at all, most wives would be suspicious of that. For that matter, what husband who wants to drive his wife to a heart attack, would go to the trouble of having an actual coffin shipped into his living room? Wouldn't that attract a lot of attention later when the Police start asking questions? Wouldn't it attract attention even at the time? How do you explain it to the funeral home? "No, nobody's died, but we like to be prepared." What if Mildred hadn't conveniently lost consciousness, so that they could hide it before she woke up? Surely, after she dies, the fact will come out that he ordered a coffin AND funeral wreath inscribed "To my dear wife", before she died. Isn't there an easier way to drive someone crazy, like everyone could wear moose antlers and swear that they weren't doing it? Or rattle chains, or have one of them dress up as a ghost, or anything simpler than having a real coffin delivered to your living room. Completely insane. JCR asked how a ghost could order funeral wreaths and change the inscription on the vault. I had no problem with those things. I assumed that they were just visions that the ghost was making him see. If he'd gone to the funeral director and demanded to know why his death date was on the crypt, I felt that it wouldn't have been there when he got back. You know, most people who die don't seem to have this option of coming back and wreaking havoc. If I were in charge of such things, someone as stupid as Mildred is not one of the people I would choose to grant such a second chance. Pity, after the episode started off so well. No mention of the fact that the staircase, entry hall and study were the same sets used in "The Grim Teaper"? At least Ida Lupino chose different angles than the previous director. This might have worked if there had been more suspicious characters and the story wasn't so paper thin. Whereas the supernatural element of "The Grim Reaper" made that episode a classic, here it was disappointing, dreary, obvious. Wow! I really like this episode! I do agree with Graeme about the coffin in the house issue, but other than that, I never thought Mildred had returned, I took the story to be the two culprits going crazy as payback for what they'd done. Of course you can see it as a ghost story too, and I love that ambiguity. I've been watching these episodes in order and then reading about them here, which is great, I love all the comments and information. But this is the first time I seem to be in major disagreement. I think this is a beautifully shot episode, essentially about three nervous breakdowns. The score works, too. I rate this one a bit higher than most who have commented here. I'm shocked nobody has mentioned this but for Hitchcock fans, this episode provides a strangely mind-bending pairing of Miss Lonelyhearts from "Rear Window" (Evelyn) with Gavin Elster from "Vertigo" (Helmore). I found it quite satisfying actually because in "Vertigo" (spoiler alert), he gets to remain a cool customer throughout, never squirms in the slightest and never gets caught. It's fun to see him here in a similar endeavor (trying to off his wife) but actually getting caught. And by the way, yeah, it's pretty crazy they used the same house in back-to-back episodes (albeit from different seasons). Sure, we've seen 9 million variations on this story but I still loved it. The cast was great, the big old house, the piano, the coffin — not a great story but a lot of delicious little elements here.